Leah and I come from a background of a cooking/food-loving family- yes, we are Italian! Our aunt and uncle own a restaurant, and another aunt worked as a chef and once cooked for Thomas Keller. All of our family gatherings have pretty awesome food, and Leah and I have enjoyed contributing recently as we have developed in our cooking skills. No family gathering in our family is complete without a cake! For Memorial Day, strawberry rhubarb crisp was already on the menu, but no cake, so we decided to contribute one. 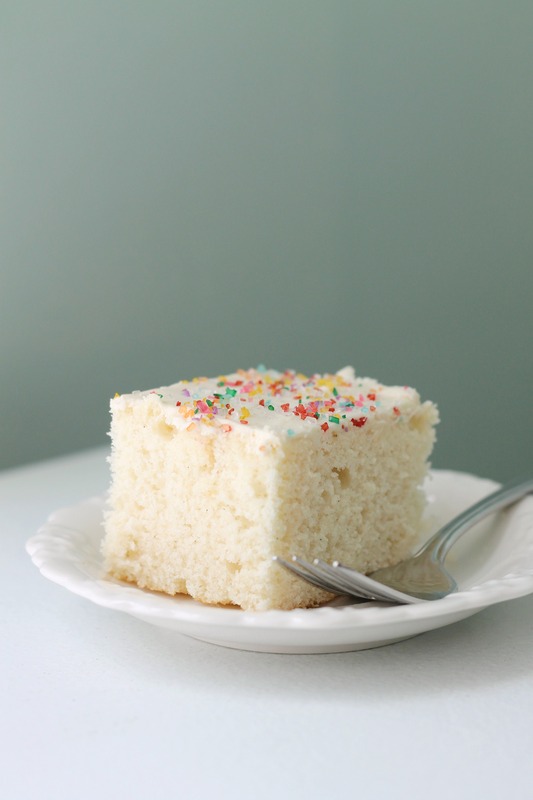 You can’t go wrong with white cake, so we opted for this lovely one from Sweetapolita that has a hint of almond extract. It is a very tender cake that is also quite easy to make. We underestimated the amount of frosting needed for the sheet cake (we made a 2/3 batch), so as you can see above, the frosting is a little sparse. We will make more frosting next time, and have reflected that below. But other than that, there is not a single change we would make to this cake. You should really give it a try since it is simply one of the best white cakes ever! Preheat oven to 350°F. Grease and flour a 9×13 inch cake pan. In a medium sized bowl, stir together the eggs, 1/4 cup of milk, vanilla, seeds from the inside of the vanilla bean, and the almond extract. In the bowl of an stand mixer fitted with the paddle attachment, combine the dry ingredients and the sugar on low speed. Add the butter and mix on low speed for 30 seconds, then add in the remaining 3/4 cup of milk, and combine on low speed until just mixed. Increase to medium speed and mix for 1-1/2 minutes. Scrape the sides of the bowl with a spatula and begin to add the egg and milk mixture in 3 separate additions. Beat on medium speed for about 20 seconds after each addition. Pour the batter in the pan and smooth, pushing batter to the edges to leave a slight well in the center (this will help the cake bake without a dome in the center). Bake for about 35 minutes or until a cake tester comes clean when inserted into the center (check at 30 minutes, and keep checking at 5-minute intervals until the cake is done cooking). The top will be lightly browned. Let cool fully in pan (we don’t recommend using a metal pan since the cake can develop a metal flavor if it sits in there too long). In the bowl of an stand mixer fitted with the paddle attachment, whip butter for 8 minutes on medium speed. The butter will become pale and fluffy. Add sugar, vanilla, milk, and pinch of salt and mix on low speed for 1 minute, then on medium speed for 6 minutes. Spread frosting over the top of the cooled cake and top with sprinkles, if desired. Cut into slices and serve. Enjoy!